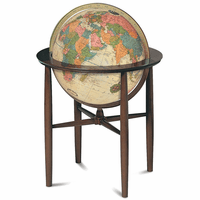 The beauty of this 16' diameter globe starts with the antiqued parchment white ocean background. 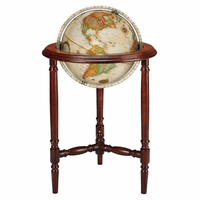 Muted colors deliniate each country, along with mapped locations of cities around the world, with a light inside that illuminates the globe from within. 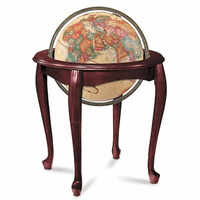 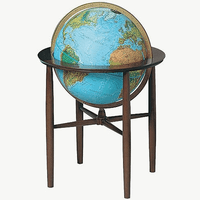 The stand features the signature Queen Anne styling, with 4 curved legs and horizontal round border around the globe, and holds a full die-cast meridian that secures the globe at the poles and attaches it to the stand. Elegant and fascinating, this will be a spectacular gift for someone special!